by wangdu on October 15, 2013 in News, Projects, Rigul Trust. Francois has arrived safe an sound in Rigul, Tibet. Here he sends a photo of himself and some of the children taken on his safe arrival on Monday 14th October. I want to express my appreciation to all the sponsors and Rigul Tulku Rinpoche for the selfless support, love and care to the Rigul children and in school during all these years! Up to now, we have over 50 children entered the public schools and/or monastery for higher grades studies after studying in the Rigul school. Some of them are even in high school or colleges. 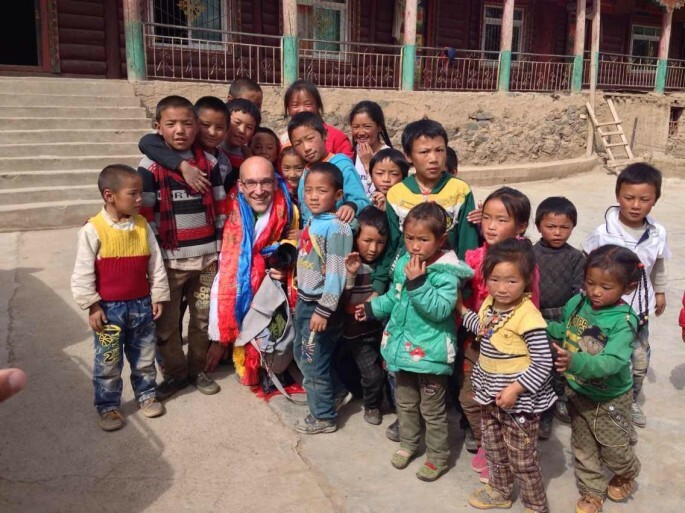 The atmosphere is very good in our hometown, children are learning languages in Chinese, Tibetan, and English; Studying Tibetan culture and Buddhism. People in the villages now all understand the importance of the children getting educated, as children are the hope of the future. It’s really a wonderful change we can see today, which is exactly in line with the initial intension of establishing the school. We will continue this important work, letting more children receive an education at a young age, help them cultivate good ideology. Please continuously give us your great support! Sending my good wishes to you on the success of the school. Please continue with your valuable work. Thank you, Francos, good work! All the best in Rigul and School and all our love to the children! Dear Rinpoche and dear Francois, very nice photo and good to witness Bodhicharya’s support and help to the childeren in Rigul, Tibet. This makes everybody so happy, thank you. May more and more contribute for the benefit of those in need. Indeed a very worthwhile project of Rinpoche!